Treasure Island Resort Condominiums offer some of the most amazing views of all of the Panama City Beach vacation rental condos. Due to the location on the east end of the beach and the unique positioning of the building, you can see down the entire gulf coast from the balcony of your unit. The building is angled so that the balconies face southwest, rather than straight out to the beach, and the result is views and sunsets you’ll remember for the rest of your life. Treasure Island Resort offers one two bedroom/two bathroom with bunk area floor plan and one three bedroom/two bathroom floor plan. Each floor plan has a mirrored version, but the layouts are exactly the same otherwise. 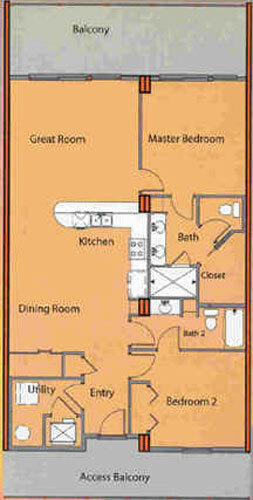 The two bedroom/two bathroom with bunk area floor plan at Treasure Island Resort has two versions. The first version is the right mirrored plan and the second is the left mirrored plan. The right mirrored plan can be found in units that end in 03, 05, 07, 09 and 11. The left mirrored plan can be found in units that end in 02, 04, 06, 08 and 10. Both floor plans are 1,370 square feet. As you enter the right mirrored floor plan (shown in the picture), the first bedroom will be on your right hand side and a utility closet will be on your left hand side. The first bedroom has access to the first bathroom. As you continue forward into the condo, the second door on your right is access the same bathroom that is connected to the first bedroom. The condo then opens up with your kitchen straight ahead and your dining area off to your left. You’ll notice a closet on the shared wall with the utility closet that will contain two bunk beds in most units. Check with the owner to make sure they have this bunk area if it is important to you. As you walk around the kitchen peninsula, you’ll enter the great room/living room area that opens up onto the balcony with a sliding glass door. To your right is the entrance to the gulf front master bedroom. When you enter the master bedroom, you’ll see a sliding glass door leading the the balcony on your left and a door leading to the master bathroom on your right. The master bathroom has a his and her sinks, a shower and a walk-in closet. The left mirrored floor plan is exactly the same, except for the fact that everything is mirrored. Since these balconies all face south west and do not wrap around the building, there are virtually no other differences between the left mirrored and right mirrored versions of this floor plan. Just like with the two bedroom/two bathroom with bunk area floor plans, the three bedroom/two bathroom floor plans come in two versions that exactly mirror each other. Both versions have 1950 sq ft of interior space. 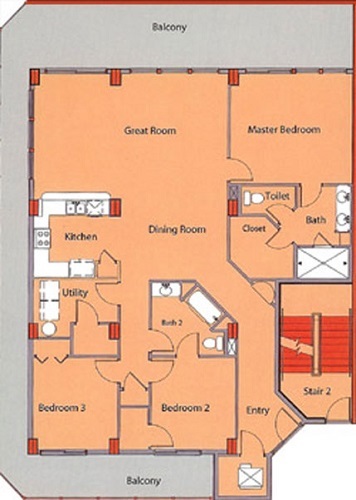 The first version of the floor plan (shown in the picture) is on the very east end of Treasure Island Resort Condominiums and can be found in units that end in 01. As you enter the unit, there is a utility closet on your left and a hallway straight ahead. As you walk down the hallway, the condo opens up into the dining area with the kitchen to your left and the living area/great room straight ahead. The great room features amazing windows and a sliding glass door that leads out onto a huge wrap around balcony. The balcony is enormous and actually wraps around three sides of the unit and has great views of Panama City Beach and St Andrews State Park. Due to the angle of the building, you can see the entire stretch of Panama City Beach as you look to the west. As you enter from the dining room into the great room you’ll find a door to the gulf front master bedroom on your right hand side. The master bedroom has its own sliding glass door onto the wrap around balcony as well as a private bathroom. The master bathroom has his and her sinks, a walk in closet and a water closet. As you enter into the dining area from the hallway you can find the other two bedrooms and a utility closet by taking the hallway on your left just before the kitchen.The first door on your right is a utility closet. Straight ahead down the hallway is a small storage closet. The door on your left is the second bathroom which has a sink, tub/shower combo and a toilet. Continue walking down the hall to find the second bedroom on your left. This bedroom has a small walk in closet and an entrance to the second bathroom from within the bedroom itself. This bedroom also has a sliding glass door that takes you out onto the north side of the wrap around balcony. Back in the hallway, if you take the second door on your right you’ll enter the third bedroom. This bedroom has a standard sized closet with folding doors and a sliding glass door that leads to the north facing side of the wrap around balcony. The second version of this three bedroom/two bathroom floor plan is almost identical except for the fact it is mirrored and the unit will be on the far west end of the building. These units can be found in units that end in 12. The main differences for the west end version of this condo is the balcony. This balcony faces south, west and north. It does not have views of St Andrew’s State park like the eastern unit does, but the views down Panama City Beach are absolutely amazing. Other than that distinct difference in views, these units are exact mirrors of each other. Visiting Panama City Beach? Learn More! Are you visiting Panama City Beach, Florida in the near future? If so, be sure to check out the rest of our site, MyBeachInsider.com! We’re working hard to show you everything about our city, even the things only insiders and locals would know! What buildings in PCB offer the largest ( deepest) balconies? While I haven’t had the time to post all of the floor plans out there yet, based on what I’ve seen so far (to the best of my memory) buildings like, Ocean Ritz, Twin Palms, Emerald Isle, Ocean Reef, Ocean Ritz, Ocean Villa and Palazzo can have deep balconies depending on which floor plan you choose. Some of the condos in these buildings all have deep balconies while others may only have deep balconies on certain floor plans. If you’re looking to buy, make sure you check with your real estate agent. If you’re looking for a rental, you can call and ask the owner or rental agency how deep their balconies are.